Venise Lace / Guipure Lace is a strong choice for regal brides looking to fulfill their fairy-tale wedding. Inspired by 16th century crafts, this handmade bridal lace gained its popularity in the 19th century. The heavy lace, with an open background, features close-together stitching that creates a raised design, perfect for bridal gowns. Venise Lace, also called Guipure Lace in the European market, is made up of silky threads connecting floral, or other, motifs. This bridal lace mimics the style of ivory carving. The rich aesthetic choice made the lace popular among Europe’s elite, and royals, as sleeves and collars. Historically, the lace was used to show high status to other elite families, this bridal lace is a perfect choice for the elite bride, or for a bride who wants to live out their very own fairytale. 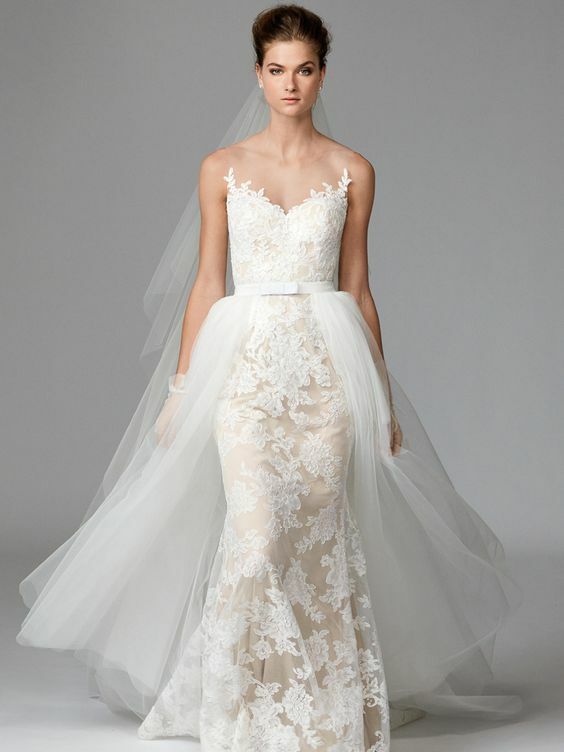 Battenbur bridal lace is for the bride who knows what she wants. Battenburg, a noticeably heavy bridal lace, is made through a unique combination of mixing stitching patterns of linen braid, and connecting them with decorative linen stitching. This practice is easily done by hand, and therefore, found in a lot of vintage bridal gowns. For a bride who has a specific bridal lace design in mind, this could be the best option. Battenburg lace can differ in design, as it often depends on the stylistic choices of the lace maker. Battenburg lace can be harder to find, but for a bride who has her mind made up, it is certainly a possibility. Point D’Esprit For a fun and simple bride, Point D'Esprit lace might be the way to go. The lace is visually similar to a Dotted Swiss lace. It appears as thin tulle scattered with woven dots sometimes in an oval shape. This delicate lace is perfect for bridal gowns, and can be used as a top layer for a light and airy look, or can be layered for interesting texture. Depending on the style of the bride, other embroidery can be added, or it can be left plain. This is a great, soft choice for lace. The feminine bride would be beautiful and comfortable in any bridal gown with this Point D’Esprit lace. It is visually and physically delicate, and a perfect choice for a modern bride. 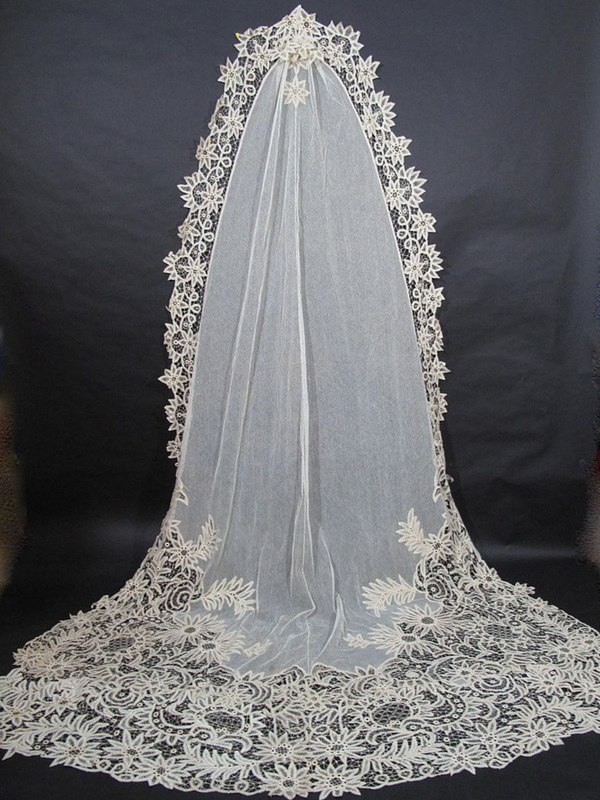 Schiffli Lace has a unique production, and is also an American manufactured bridal lace. Schiffli lace is produced by using a sacrificial fabric. This means, a fabric is introduced to a chemical that will disintegrate it and an embroidered pattern is added to the treated fabric. After the pattern work is created, the sacrificial fabric will disintegrate leaving behind the beautiful embroidery to stand alone. This machine produced lace is used successfully on bridal gowns as beautiful appliques. 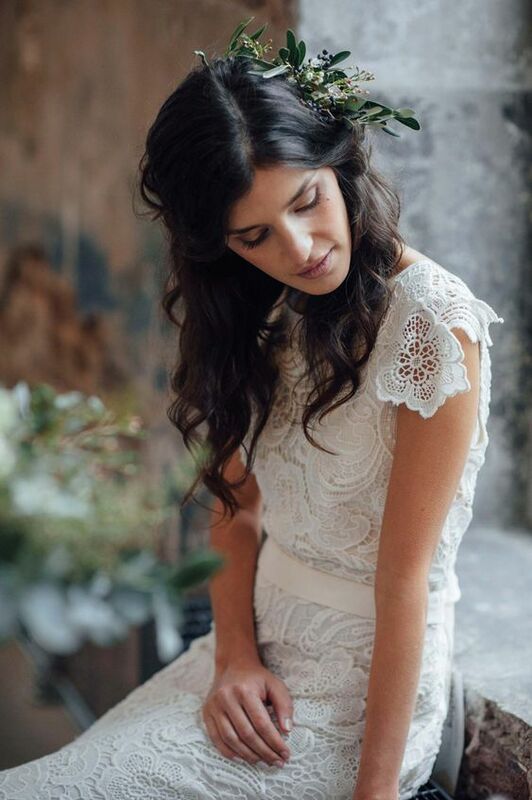 Schiffli, as a long standing American bridal lace, has a specific vintage aesthetic to it, that will make any vintage seeking bride feel beautiful in their gown. If you are an environmentally friendly bride, don’t fear this lace. Updated technology allows manufacturers to now use a water soluble fabric to create this look, without all the harmful chemicals. So, you can still look feminine on your wedding day, and feel good about your wedding gown choice. Honiton Lace For a classic, or traditional bride, Honiton lace might be the way to go. Honiton is a handmade bobbin lace, which has been recognized for its beauty and design for centuries. The lace was, and still is, produced in England, and was Queen Victoria’s choice for her own bridal veil. This bridal lace is at the origin of the white wedding tradition, and therefore is such a timeless choice for any bridal gown. Honiton lace is made by creating separate complex patterns, and then attaching them together to create beautiful repeating motifs. Honiton Lace is great for trims, and adds detailed florals, and patterns to any bridal gown. This lace is a great choice for a bride who loves the classics, and is searching for a wedding gown to surpass their dreams. Alençon Lace, also known as corded lace, is a beautiful choice for a bride to wear on her bridal gown. This lace type is a needle lace produced in Northern France, and is identified by the 3-D effect created on the fabric. Alençon is a lightweight lace, making it a great choice for your wedding gown. The bridal lace sets itself apart from other beautiful laces by incorporating outlining details using cording, or heavier thread. This technique provides the lace with a dimensional appearance. Alençon lace is a great choice for a bride looking to be elegant in her bridal gown. For a bride who prefers more sparkle, Alençon lace can also be beaded with seed pearls and sequins, adding even more depth to this feminine lace. Chantilly lace is a famous, French, silk lace. It dates back to the 17th century, and a has a deep history with European royals, making it the perfect choice for a bride who wants to feel like royalty. Chantilly laces used to be produced in only black, but have been adopted into bridal gowns because of their distinctive bridal look and style. This bobbin lace can be identified by any bride by its fine and delicate designs laid on top of a lightweight hexagonal mesh. The famous bridal lace is known for its fine outlined pattern and abundance of details. Chantilly lace is a great choice for a bride who wants her dress to be as beautifully detailed as her love story. Embroidered lace is perfect for a bride who wants to be unique on her wedding day. Using an embroidered lace on a bridal gown can allow the lace to be more detailed or decorative. Embroidered lace is typically seen as a pattern or motif that is tightly stitched onto an illusion base, sometimes allowing the lace to appear as an appliqué. 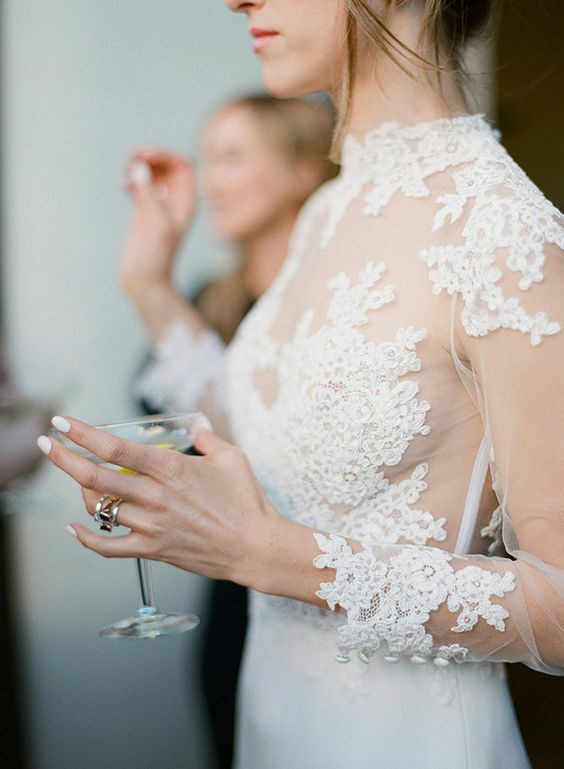 These patterns are often super delicate, and a beautiful touch for any bride to wear. The embroidery process can create an illusion of depth as the bridal lace can be finished with beading, florals, and cording. This type of hand or machine crafted design gives your designer an opportunity to get creative. Brocade lace is the bridal lace for the fabulous bride. This lace type often includes colored silks, mostly gold and silver accent thread, that make the bridal gown look rich and decorated. Although this style may not be the choice for a minimalist bride, it is sure to make you look and feel like royalty. The fabric is weaved in a specific way so that some of the threads are raised, making this style of lace appear similar to an embroidered lace, but with an opaque fabric. This lace is a perfect choice for a bridal gown, and can often be used on the bodice to make the bridal gown feel more ornate. If you are a bride who wants to feel lavish on your wedding day, brocade lace might be for you. Knit lace is a good choice for a bride who wants an elegant look, but does not want to jeopardize comfort. A knit lace is a machine made, flexible fabric. 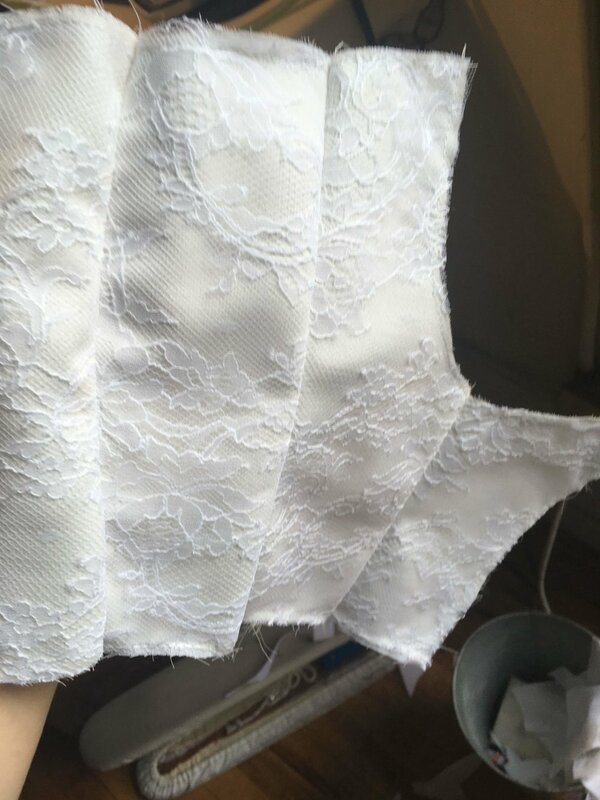 This bridal lace will stretch more easily around the body, and can make a more easy-to-wear bridal gown. Knit lace is often made without a tulle backing, so you will have that stand alone look, without the stiffness associated with other fabrics. If you’re a bride who wants to be more comfortable in your bridal gown, knit lace is a way to get comfort without sacrificing style. Eyelash lace is a delicate French Lace. It can be commonly found on lace bridal gowns and bridal intimates as it is considered to be a soft, and ultra-feminine lace. This bridal style creates a very classic wedding look, and some brides consider it to add a vintage flair to modern bridal gowns. The eyelash lace receives its name from the thin, wispy threads that line the edge of the lace fabric, and resemble eyelashes. This bridal lace type has a strong impact when used at the sleeve, or neckline of a bridal gown. It is in these locations that the small detailed trim really brings a feminine flair to the brides look, making her feel beautiful on the special day.